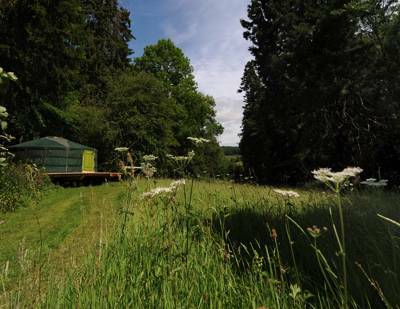 The Yurt and shepherds hut are exclusively yours. You wont be sharing the site with any other holiday makers, so your privacy is guaranteed. 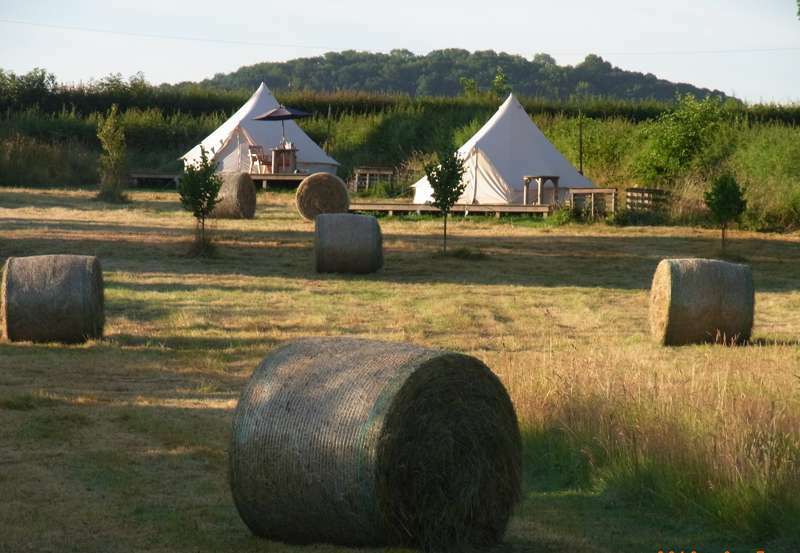 Secreted in deepest Herefordshire on a one-and-a-bit acre garden ablaze with flowers (and featured on the cover of the Royal Horticultural Society magazine, no less), The Yurt at Midland Farm is so rurally perfect it might have leapt from the pages of a Thomas Hardy novella. The name somewhat underplays what's on offer here. 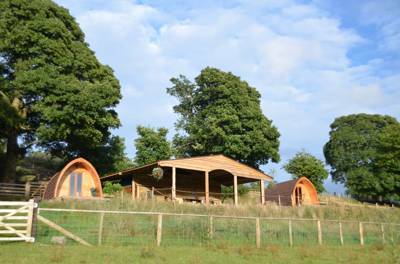 For as well as the spacious 19ft Mongolian yurt, guests are also spoiled with an adjacent shepherds hut housing their own private kitchen and bathroom facilities – all overlooking a field grazed by the resident ponies, Sam and Frodo, and back-dropped by a deliciously vocal rookery. Inside the titular abode, the decor is as vibrant as the profusion of wildflowers in the surrounding gardens, bedecked in patchwork throws, lanterns and cheerful bunting festooned about the latticework. The gorgeous antique French double bed (as well as a pair of singles) offers the utmost in nighttime comfort, while the structure's felt lining keeps you cool in summer and, along with the wood-burning stove, warm on chilly nights. Twenty yards away you'll find your none-more-hospitable hosts Sarah and Charlie’s charming redbrick cottage where, of a morning, you can buy hens’ eggs here and freshly baked bread. Beyond the canvas, Midland Farm is abuzz with wildlife. The carefully cultivated pond is a hub for frogs and newts, with dragon and damselflys zipping through the midsummer air and a local Heron making frequent visits. As dusk descends, the residents of the rookery are accompanied by hooting owls and the evensong of innumerable other birds passing to-and-fro from the nearby RSPB sanctuary at Letton Lakes. Welcome to the Yurt at Midland Farm. 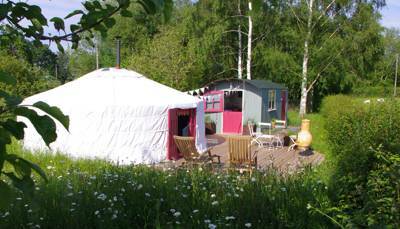 Sarah and Charlie Smith welcome you to the Yurt at Midland Farm for your ultimate glamping holiday. You have exclusive use of the site, so your privacy is guaranteed. 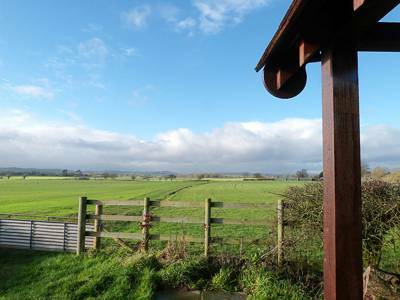 The yurt comes with its very own shepherds hut containing your own kitchen, dining area and fully plumbed in bathroom. 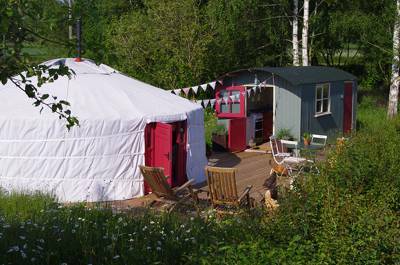 The Yurt is a genuine Mongolian yurt with proper felt lining to keep you cool in summer and warm on chilly nights. It has its own wood burning stove, and you can cook al fresco on the barbecue in the woodland area. We provide you with bed linen, so all you need to bring is a torch and supplies. Car parking is provided near to the yurt, so you don't have to carry stuff long distances. 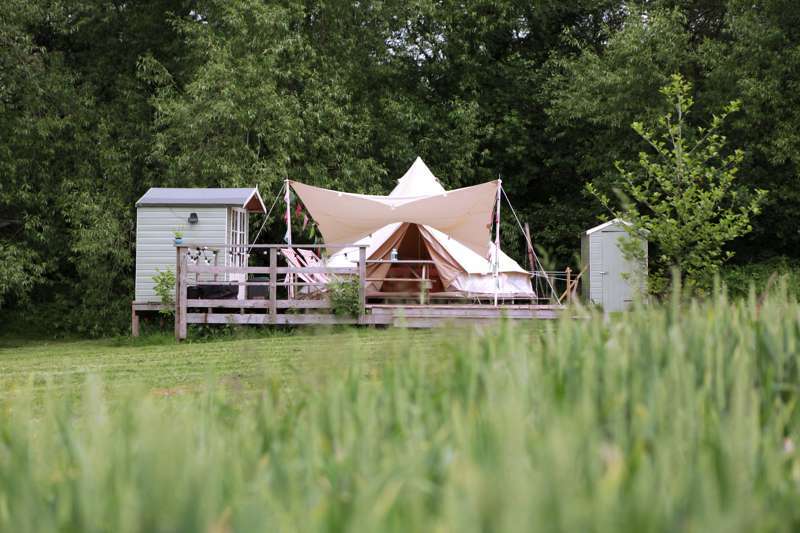 19ft yurt (complete with antique French double bed), decked area, and shepherd’s hut with shabby-chic kitchen and modern electric shower and loo. Kids can ride or be lead on a rein on Shetland pony, Nutmeg (£10 for half an hour). There are also hens and Shetland sheep. The surrounding area is spoilt with scenic walks, not least the ridge at The Cat's Back and the famous Offa's Dyke path. 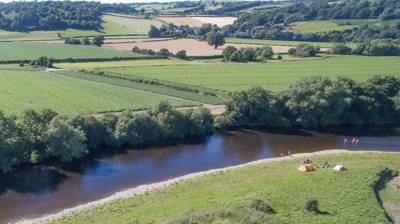 For the more intrepid, the Wye Valley has some great kayaking and canoeing trails. The historic cathedral city of Hereford is around 12 miles from Midland Farm while the Welsh border town of Brecon and the bibliophiles' haven of Hay-on-Wye are a mere 30 mins drive away. 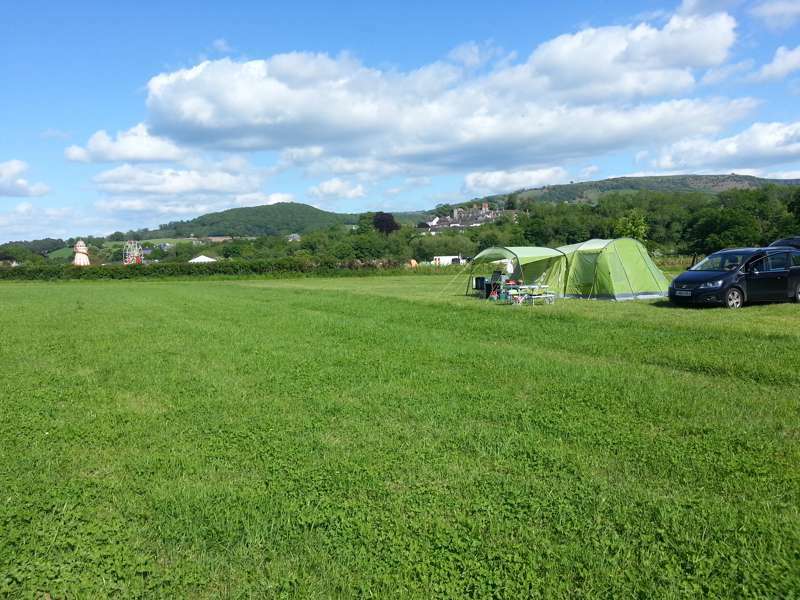 For pony treks try Brwyngwyn Riding Centre in the beautiful hills just above Hay-on-Wye. (01497 851 669; one hour hacks kids/adults £17/20). 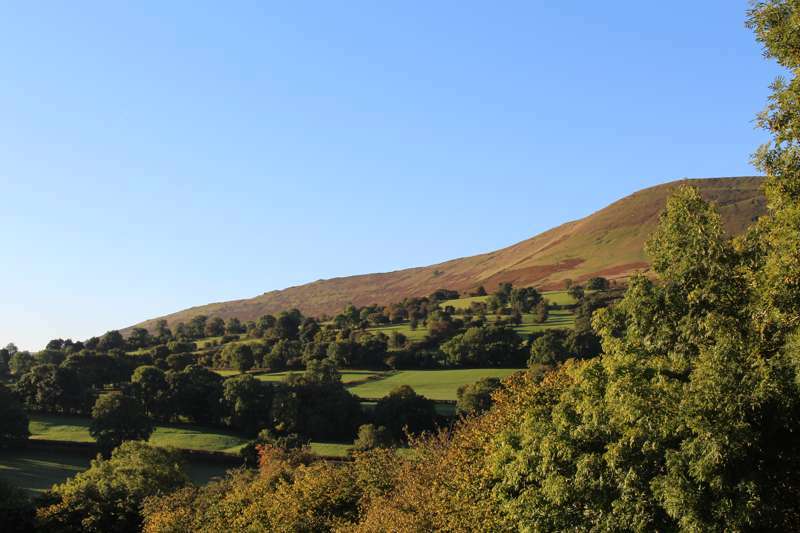 Cycle mapped routes in the stunning Black Mountains and Brecon beacons with Black Mountain Activities (01497 847897; half a day/full day hire £20/30). They can also deliver bikes to your yurt. The Stagg Inn (01544 230221)15 minutes’ drive from Midland Farm offers very fine dining. The other side of Hay, The Griffin at Felin Fach (01874 620111) is lauded by top newspaper critics and is best visited for lunch for its set menu. 1st March – 30th October. 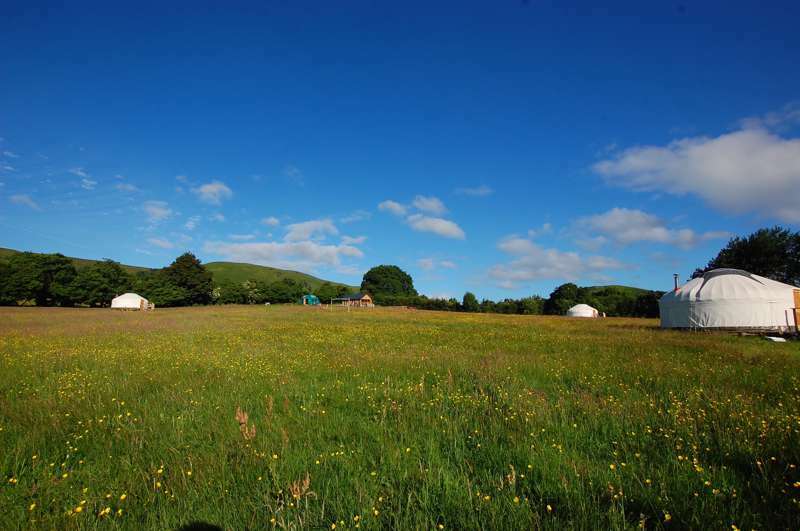 The yurt with shepherds hut costs from £80 - £125 per night, with a minimum of 2 nights. Take the A480 west out of Hereford. After 6 miles pass through Yazor. 2 miles past Yazor take the turning on the left to Norton Canon. Carry on for 1.5 miles till you see a white house on the left called New House Farm. Beside it is a track to Midland Farm.